Kent McIntosh, a professor in the College of Education’s Special Education and Clinical Sciences division, is the university’s newest Philip H. Knight Chair. 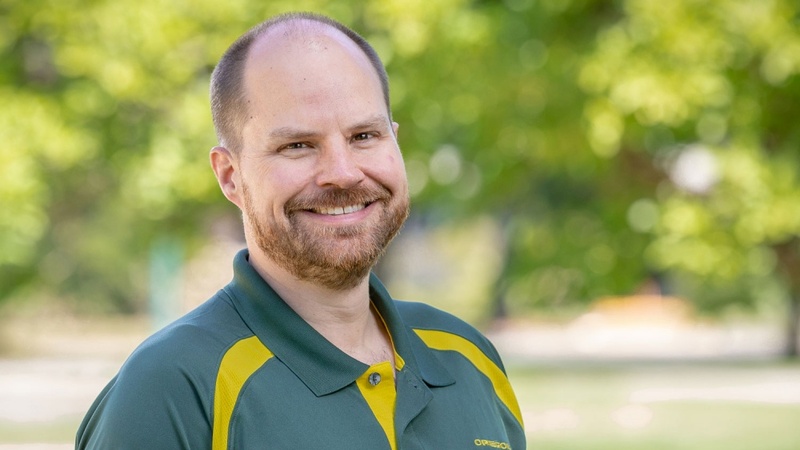 McIntosh joined the UO faculty in 2012 after earning his master’s and doctorate from the College of Education. His research has focused on how to establish a healthy learning environment in the classroom. Perhaps the most visible aspect of his work is as co-leader of the Positive Behavioral Interventions and Supports network, which can be found in more than 26,000 schools nationwide. And it was via that network that the university last year landed what is believed to be the largest grant in UO history, $32.6 million from the U.S. Department of Education. College of Education Dean Randy Kamphaus echoed the provost’s assessment. The Philip H. Knight professorships and chairs were endowed in 1995 with a $15 million gift from Penny and Phil Knight. The program is designed to help the UO retain star faculty members. The gift for endowed chairs and professorships requires matching funds from other donors and has led to more than 30 such positions. McIntosh represents the UO as the lead institution in the behavioral support network, which includes three other universities and a total of 11 partner organizations around the country. It emphasizes teaching good classroom behaviors over assuming students know the rules and punishing undesirable behaviors. McIntosh is also a founding member of a partner network in Canada. The network falls under the college’s Educational and Community Supports unit, which McIntosh directs. Last year, in what is believed to be the university’s largest grant ever, McIntosh was instrumental in landing the five-year, $32.6 million grant for the network. The funds will go toward learning how to better teach students with disabilities and builds upon the college’s 20 years of expertise in running the network. McIntosh also researches racial disparities in school discipline and developing methods to decrease the racial gap in use of exclusions. He earned his master’s degree in special education in 2003 then his doctorate in school psychology in 2005. He then joined the college’s faculty as a postdoctoral fellow, working closely with Rob Horner, founder of the Educational and Community Supports unit. He then spent six years as a faculty member at the University of British Columbia in Vancouver, Canada. The university has recognized McIntosh’s expertise several times in the past. He received a Fund for Faculty Excellence Award for the 2016-17 academic year. The award is designed to further the university’s commitment to improving its academic quality and reputation by recognizing, supporting and retaining world-class, tenure-related faculty members. In 2015, McIntosh was awarded the 2015 Distinguished Early Career Research Award from the research division of the Council of Exceptional Children. Additionally, he was selected for an Early Career Scholar Award by the Society for the Study of School Psychology. Prior to last year’s major grant, McIntosh had secured more than $20 million from the U.S. Department of Education and other private foundations for his research. The last Knight appointment was anthropology professor Lynn Stephen, a renowned Latin America scholar, in 2018.